Home > Superfoods > What are Superfoods? The term superfood was initially given by nutritional specialists (mainly in the media and food sales industry) to describe those foods that are deemed to be very good for our health. This is because these food items are packed with essential vitamins and minerals and complex compounds that are not often seen in many of the foods we eat on a regular basis. This is in part due to the type of diet we are eating in the modern western world as we have less time and finance to buy and prepare wholesome foods so we seem to stick to frozen meals and processed foods that are not particularly beneficial to health. Many nutritional experts now deem the term superfood to be slightly misleading and a ploy of the producers and retailers as a way of fooling the public into thinking their health is protected by food alone. Whilst food does play a huge role in our health there are also other contributory factors such as lifestyle, genetics, pollution and employment that may risk our health. In fact many experts believe the term superfood should not exist as the foods classified into this group are products that we should have been eating regardless of marketing and that the public need re-educating on threw whole subject of food and nutrition. What Sort Of Vitamins And Minerals Are Found In Superfood? The answer to this question really depends on what sort of superfood you are referring to. This group of foods is not small so the amount of different minerals and vitamins available to you is quite extensive. In general, as long as the produce is fresh and not processed, it is likely that is will contain some vitamins and minerals. Most of the products in the fruit and vegetables group contain high levels of vitamins, minerals and anti-oxidants so these are superfoods. The general rule is, the more organically grown the better it is for you. Also, the darker the colour for example, dark green or deep red, these contain more substances that are good for our health. There has also been a surge in the number of people buying exotic berries, nuts and herbs that we do not commonly see in Europe which are flown in from other countries but it is questionable whether we could receive the same nutritional benefit from home grown products and whether the media and food industries have exploited the term superfood. How Are These Good For Health? Any fresh fruit, vegetable, herb or even nut will contain essential vitamins, minerals, sugars and fats that we need to keep our body healthy. The list of these substances is very expensive and each component plays a different role in the body. Superfoods are easily taken in a healthy, balanced and varied diet. Just because these types of food are good for you doesn’t mean they have to be boring or enjoyed very little. A small amount of imagination and creativity in the kitchen can go a long way. 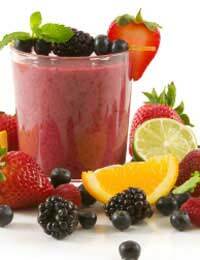 Experiment with sauces, soups and even smoothies and milkshakes until you find several recipes that both you and your family can enjoy regularly. Small treats such as ice-cream or chocolate will be enjoyed all the more if you are assured that the rest of your diet contains all the essential items you need to stay healthy. If you are not very talented in the kitchen, there are several companies that make ready made recipes that contain all the ingredients that allow it to be called a superfood. They are usually drinks and soups that have been specially created to not only offer all of the benefits to health, but are normally very tasty and enjoyed by many people. They do tend to be quite expensive however it really is worthwhile trying to make your own. Including your children in the preparation of your chosen recipes will give them the opportunity to not only learn how to include healthy food into their diet but also offers an opportunity to spend quality time together whilst learning about the relationship between health and food. It is not a secret that the foods classed in the superfood group are extremely good for our health as most of the foods in this group are fruit, vegetables, nuts or fish, there is controversy however surrounding the over use of the term and how it may mislead the public. This is because we should be eating these foods everyday anyway, not because someone has suggested that they are special, or because they have been imported (which makes them expensive a lot of the time). The public should learn more about food and how to include it into their diet on a daily basis. Frozen ready meals should be the treat, not a bowl of fruit salad or freshly made soup for example. We live in a society at the moment where what was once classed as a ‘treat’ is now the norm and the products that used to be the staple part of everyday diet, are now being seen as special which is not really how it should be.